Parenting can be such an adventure. These kids didn't show up with user manuals unfortunately. So, you just try to do the best you can. Unfortunately, I've learned the hard way that you generally don't realize you've made a parenting mistake until after you've already done it. I know I am guilty of this one! S, I just try to do the best I can. This often means reading every parenting book I can get my hands on. 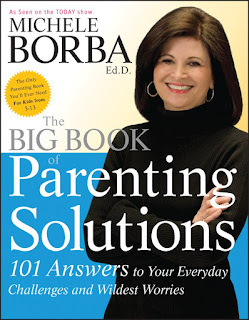 Since I am always striving to be the best parent I can, I was thrilled to be given the chance to review The Big Book of Parenting Solutions by Michele Borba. This great book contains "101 answers to your everyday challenges and wildest worries". There is truly a lot of valuable information packed into this book! You are very likely to find something in the book on every parenting challenge you can think of. I give it two thumbs up! Check out what the book says about being selfish. It's good advice! Teach your child to wait. Selfish kids want their way N-O-W. They rarely stop to consider whether you or anyone else is being inconvenienced. You need to stretch your child’s waiting quotient so that he doesn’t put his own needs in front of others’. If you’re on the phone, put up your finger and signal that you’ll talk to him in a certain number of minutes. If you’re at the mall, tell him you won’t stop what you’re doing to go to the bank for more cash. He’ll have to make the purchase when he remembers to bring his allowance. If he wants to get on the computer, don’t let him push his sister’s time aside to suit his own convenience. It will take patience and fortitude on your part, but a less selfish attitude will be the outcome. Reinforce selfless acts. One of the fastest ways to increase selflessness is by “catching” your kid doing considerate and unselfish acts. So look for selfless behaviors in your child and acknowledge them. Describe the deed so that he clearly understands the virtue and point out the impact it had on the recipient. Require giving back. Dr. Ervin Staub, a world-renowned researcher at the University of Massachusetts, has extensively studied the development of selfless, considerate kids. His studies found that children who are given the opportunity to help others tend to become more helpful (and less selfish) in their everyday lives. Require your child to do for others on a regular basis, every day: do his chores; give part of his weekly allowance to charity; bring cookies to the shut-in neighbor; take the dog for a walk; call Grandma every Sunday to see how she’s doing. Just plain expect that he think of someone besides himself and contribute to your family. If you don’t expect him to give to others, he will feel entitled. “How do you think she felt?” “How would you feel if you were the person?” “How did you feel when you were being kind to her?” “How did you feel when you saw her reaction to your gesture?” Even better, decide to give back as a family. Find a cause you support and then bring your kids along to experience the miracle of giving. It could be taking extra toys to a children’s ward in a hospital, helping at an animal shelter, reading to the elderly. There is no better way to stretch your child than having him experience the joy of giving. Adapted from “The Big Book of Parenting Solutions” by Michele Borba. Copyright © 2009 by Michele Borba. Reprinted with permission of the publisher, John Wiley & Sons, Inc.